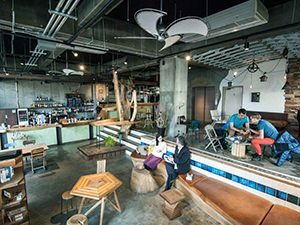 Hostels can be very generic these days, even when we speak about hostels in Tokyo! To maximize the profit, hostel managements often reduce their investment to a bare minimum. In a view to providing the cheapest possible price for the final consumer, some push as many beds as it can possibly fit into the tiny rooms. They might even leave mattresses wrapped in plastic (they have to last for years to come! ), and not equip their bathrooms with any essential amenity, such as soap or toilet paper. On the other side of this extreme spectrum, there are hostels which actually understand that modern traveler (even if backpacker) is looking for experiences. This traveler is willing to pay more than “the cheapest price” on some web search engine if the purchase will make him/her feel better. The art comes into this story as a great added value, and some of the hostels in Tokyo have learned that capsule-style idea of accommodating people (usual form of bunk bed replaced with small units often surrounded by walls on all sides except one – where the guest enters the “room”) will need to be reinvented. 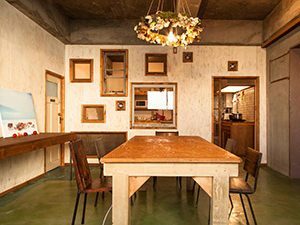 In the world where art is present in its cheapest reproduction-paintings form even in hotels, these artsy hostels in Tokyo have gone a step further, incorporating the arts as essential building stones of their projects. Opened in December 2015 in the renovated office building, ARTnSHELTER is a very convenient first stop when arriving in Tokyo. It will take only a 20-minute train ride from Haneda Airport to reach this gallery/dormitory building (Samezu Station, Keikyu main line). The impressively high lobby with the industrial feel of „work-in-progress“ is a chill-out zone with books on travel, arts, architecture and design. It obviously reflects the interests of the owner Kohei Kanomata who studied art and design, and then wanted to start a business which would connect people, and not necessarily just host them. Futa Kera’s digital art: at ARTnSHELTER roses are not pure decoration. They paint! Instead of some classical sculpture or even contemporary painting, at the entrance of ARTnSHELTER, you can witness a live drawing made by – a rose! 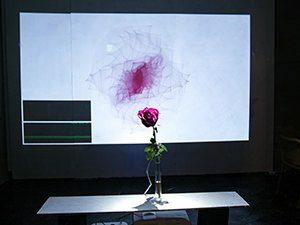 Yes, that’s right, even flowers become artists in this advanced space supporting art and technology equally. Often hosting media art exhibitions, fashion and music events, this is a real shelter for progressive guests who feel comfortable at being artists and tourists at the same time. The hostel offers the artist-in-residence program, supporting the creators with free or nearly free stay, becoming an attractive mecca for photographers, painters, architecture students… The plan is to open the dark chamber in the basement soon, so all the guests will be able to borrow the analog cameras at the reception and develop their own artwork in the hostel! The central focus point of the hostel is the reception bar, offering a good selection of whiskeys, but also free coffee for all guests. The offer of food is very basic at the moment, but it will make vegans happy; hummus comes here in different flavors, such as wasabi, chili or ginger soy. Nice jazz and trip-hop music in the background, temporary exhibitions, or even selection of Xbox games, makes it a friendly space to explore. The friendly approach will start from your check-in when you will be asked to fill out the form with your passport details, but you will also need to write down the answer to the question “If you could have one superpower, what would it be?”. Entrance to ARTnSHELTER’s fluorescent cave made by Singaporean artist Zon. When it says “Do not open”, that is the best invitation to check out what’s down there! The rooms on the first and second floor come as singles or dormitory-type (60 beds in total). But trust me, the size of the curtain-covered bed in the dorm is large enough to accommodate both you and your XXL size suitcase (if for some unknown reason you decide to sleep with it). Every floor has a small kitchenette equipped with fridge and microwave. Bathrooms come with heated high-tech toilet seats (as one would expect in Japan). The only objection to the space organization would probably be the lack of the real concrete walls between the rooms. Wooden paneling just doesn’t give much noise-protection for those birds that do not want to rise early. 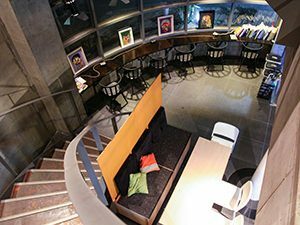 However, the overall concept and combination of art and tourism put ARTnSHELTER on the top of the list of the best artsy hostels in Tokyo. TIP: On the ground floor there is a hole in the floor with the cover saying "Do not open". 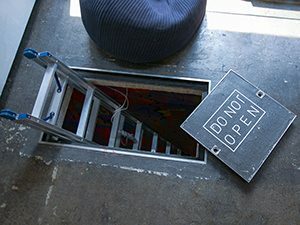 Ask the member of the staff to open it anyway, and climb down via the ladders! 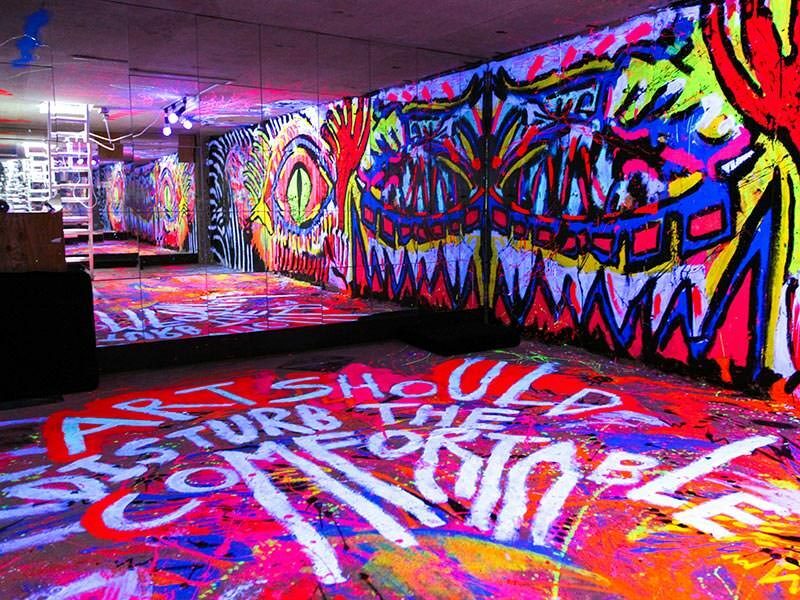 You will discover a truly psychedelic room decorated by Zon, the artist from Singapore. You might not be able to stand straight down there, but the crazy space is definitely worth seeing! Bookshelves in castles were always a good cover for secret doorways to unexpected rooms. Book and Bed Tokyo is practically a castle of books! 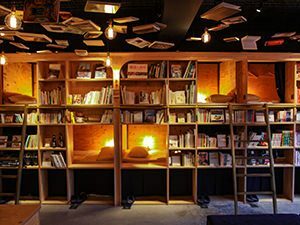 Library-themed hostel allows you to sleep in the bookshelf, with 1.700 books offering passage to the sleeping chambers – literally a place of a booklover’s dreams! Situated on the top floors of Lumiere building not far from Ikebukuro train station, it makes it an excellent starting point for exploring the attractive sites nearby. Of course, if you decide that you ever want to leave this book heaven! In your compact bunk, hidden from the outer world by the curtain, you will find the reading light (of course), but also the earplugs, which is a thoughtfully provided amenity by the hostel’s management. You could find the earplugs handy, as other readers might have loud snoring dreams – judging by my experience, some really do. And sawing of the vocal cords inside of the wooden bookshelf just accentuates the annoying sound. 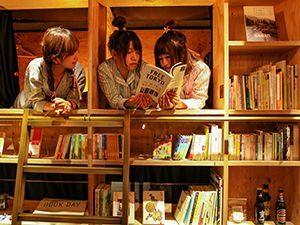 Hostels in Tokyo need more books and pyjamas! Probably the most iconic idea of coziness is maximized with the possibility of renting very kawaii pyjamas at the hostel; some Japanese come here for a girls’ night out. Pyjama party among so many books makes it for a great selfie. But many come to read for real, even if they will not spend the night in the hostel. Good selection of titles in both Japanese and English makes Book and Bed Tokyo an interesting spot for both local and international clientele. 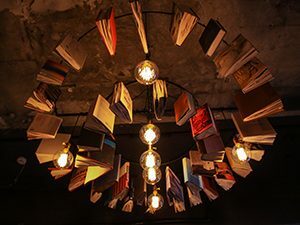 In the space covered with books from floor to ceiling (ceiling included, even with a chandelier made of books! ), curling up under a blanket on the large couch provides a real reading pleasure, that Japanese cannot experience in their often small living units. Books, books everywhere! Even in the chandelier! As the beds and the lounge are placed in the same environment, some guests might miss official quiet hours, because night bookworms could still be circulating the bookshelves even after midnight, or chatting with their friends. Then again, in comparison with other hostels in Tokyo, this is probably the most comfortable bookshelf one could sleep in, so you can’t complain much. Try the one at your home, and then compare! TIP: Unlike other hostels that will usually keep your luggage AND let you stay in their lounge area for free (hoping you would be spending money on drinks/food), Book and Bed Tokyo sadly provides only luggage storage, and if you want to finish reading your book after the check-out time (11 a.m.), you will have to pay a pricy addition to your bill, as if you are a normal daily visitor, and not someone who paid a significant sum to stay there overnight. So plan your trip and trip costs carefully! Tokyo’s Kuramae neighborhood was historically a place of rice warehouses which were transformed into the craftsmanship zones. Today it attracts designers, artists and other talented young people who live and create here, shifting the neighborhood into a trendy hotspot, away from the touristic mainstreams. Nui., hostel and bar lounge, fits well in this hipster concept. 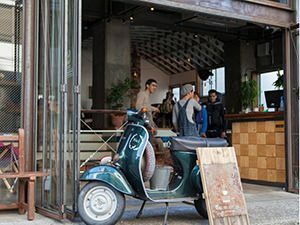 It was started by the same group wich launched toco., the backpacker’s inn which reconciles heritage and urban style, and recently they opened another hostel, named CITAN, so it seems the chain is building up! Quiet dining room for Nui. hostel guests – make yourself your own dinner! Mixing wooden and fashionable cement elements, Nui.’s eclectic but stylish interior design that especially cherishes hand-made philosophy, connects rough and cold with smooth and warm, providing guests with the feeling of coziness and comfort. The focal gathering point is the atmospheric bar lounge with grand piano, ideal for socializing. Friendly bartenders can serve you craft beer from Japanese and overseas breweries, specialty coffee of high quality, or selection of food that includes freshly baked pastries in the morning, and throughout the day: rice dishes, meat, seafood, and in Japan unavoidable “French Fried”. If you are not French, you might enjoy your meal! Five minutes walk from Kuramae station (Asakusa and Oedo lines), Nui. provides both dormitories and private rooms, while all other facilities, such as bathroom or kitchen, are shared. This means you can cook your own food, drink free tea, or browse through the small library, away from the bar’s noise, if you’d like to avoid it. The whole place has the cosmopolitan vibe and seems to deliver well if you want to meet other travelers in an informal setting. Out of all three listed artsy hostels in Tokyo, it seems the guests complain about the bad soundproofing in Nui. the most (be it the noise of the bar, elevator or hairdryer). All nice places come with some kind of price. But if you are a sociable type of person yourself, who likes to spend the time in the bar until the booze knocks you out (well, as long as it is before half past midnight when last orders are being taken here), then this might just be the place you were looking for. After craft beer you will sleep like a baby and no hairdryer will wake you up! TIP: When staying in Kuramae, Kakimori is a store not to miss, especially if you love writing! There you can make your own customized notebook (choosing your preferred cover‚ papers‚ ring color and fastener), or even refill your notebook with new paper when it runs out! Also, at the Ink Stand you can make custom colors of ink for your fountain pen! CHECK THESE HOT DEALS IN TOKYO! Disclosure: My stay at some of the establishments mentioned in this text was complimentary, but all opinions are my own. I am glad you found this article helpful! Let us know if you decide to stay in any of these and how was your experience! Good plan! There is another Book and Bed in Kyoto as well, in case you travel south. Good travels! The very definition of cool. 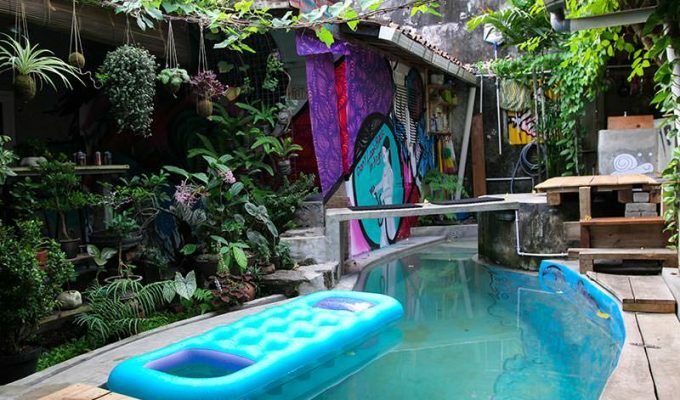 I’m not much of a hostel goer, but I definitely want to stay in all of these! Very torn about which one though!